The AutoView 1500 KVM (AV1500-001) switching system includes multi-platform support, advanced cable management options and a convenient on-screen display. Avocent AutoView 1500 (AV1500-001) 8-port, dual user KVM switch provides PS/2, USB, Sun and serial connectivity, advanced cabling options, flexible access and a next-generation user interface in one switching solution. The Avocent AutoView 1500 (AV1500-001) switch server interface modules and integrated access cables automatically assign and retain unique server names, which simplifies installation and eases re-configuration. With advanced cable management and flexible access for two simultaneous users, the Avocent AutoView 1500 (AV1500-001) switching system is an ideal solution for today's small office and mid-sized business networking environments. IIntegrated access cables offer PS/2 or USB keyboard, video and mouse connectivity in one, slim CAT 5 cable, which reduces cable bulk, saves time and reduces cost. Server interface modules support all major server platforms and VT100 serial-based devices. 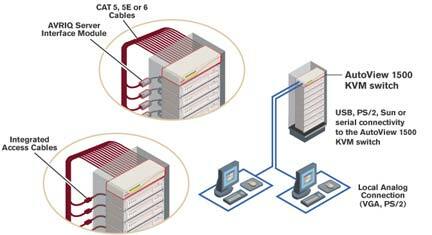 Provides two simultaneous local users with access to eight PCs and network devices. Advanced on-screen management provides easy configuration and server selection. BIOS-level access ensures connection to the attached servers regardless of the health or type of operating system. A space-saving 1U rack mount design. Flash-upgrades firmware for fast and easy updates for appliances and server interface modules. Keep Alive power safeguard allows attached servers to continue network functions in the event of power failure to the AutoView switch.